I slightly modified this list to be less competitive since my opponent wasn't bringing a tournament list. 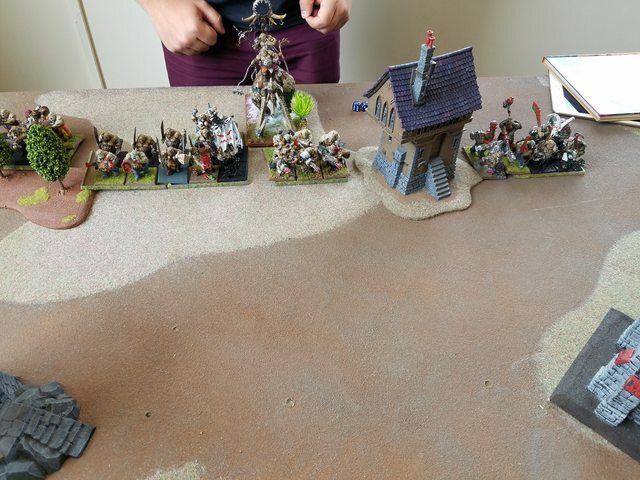 My opponent also had just bought and painted some new Ogre models and wanted to try them out, and also wanted to test out a few other things he hadn't played before/hadn't played in a long time. 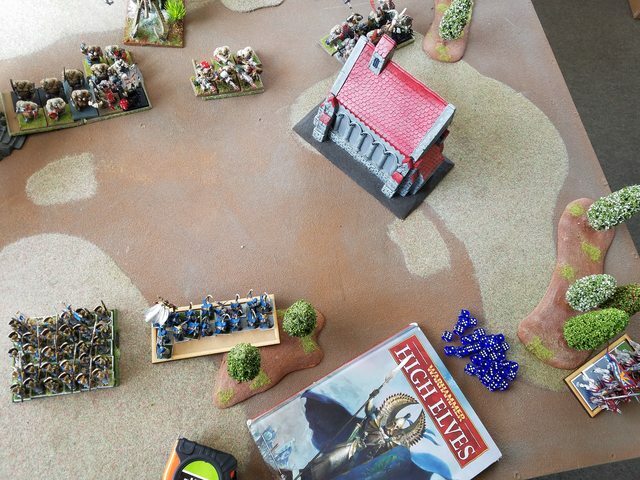 This table had a fairly large amount of terrain on it, making movement slightly difficult for larger units and even though the fliers could move over the buildings, they had trouble seeing through them so they were also constricted. The High Elf line had the Spearmen in the center with Archers on their right with the Mage. On the far right the small unit of Dragon Princes would try to draw Ogre attention in that direction. To the left of the Spears were the Reavers and behind this center force was the Flamespyre. 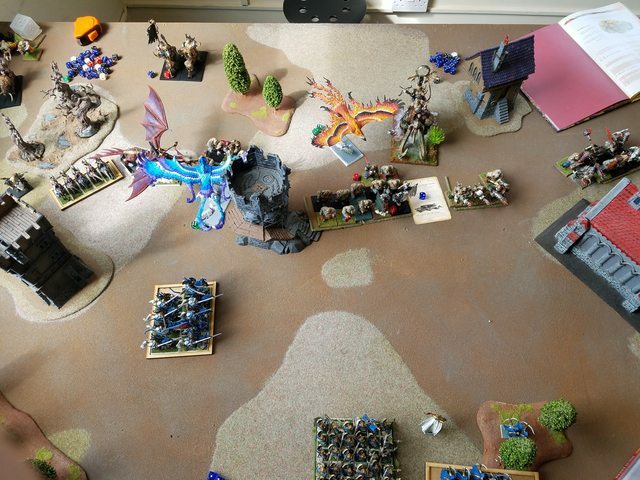 The large Dragon Princes and the Star Dragon were to the left of the Reavers to drive up the left flank and the Frostheart was on the far left. 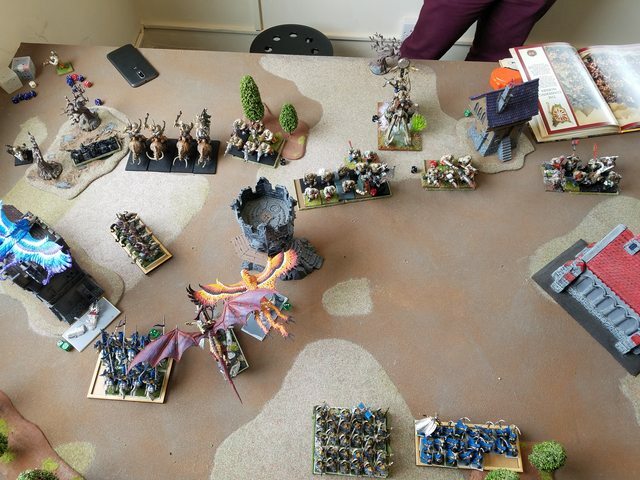 The Ogres put the Hunter opposite the Frostheart with the Gnoblars in some trees on their far right and the Mournfang set up to counter the Dragon Princes. 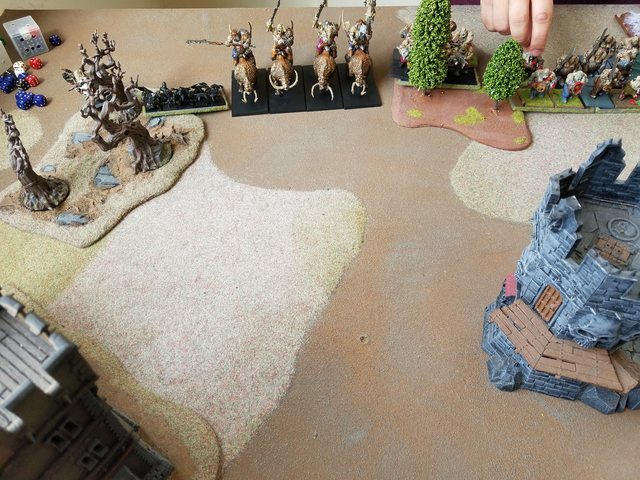 The Ogre center held the Bulls with the BSB and Butcher inside and the Thundertusk behind. One unit of Leadbelchers bridged the gap between the Mournfang and the Bulls and the other was on the Bulls' left. The Ironguts with the other Bruiser were on the far left. The Reavers vanguarded up behind a tower. The Ironguts are out of place and I think I can exploit that and draw them further away with the Small Princes. 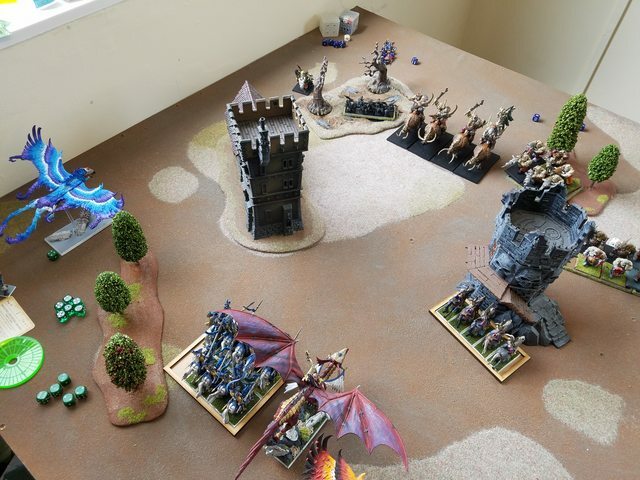 The Ogre center will advance hard and fast and I'll try to slow it down with the Spearmen and Archers while the Frostheart, Dragon Princes, and Star Dragon deal with the Ogre right flank, then they will circle back around behind the Ogre center to destroy them. The Thundertusk isn't supporting the Mournfang which is good news for me. The Leadbelchers could be a problem particularly for my cavalry so they will need to be dealt with. The lack of a Level 4 should mean magic is much more balanced than I had thought it would be, and without a Tyrant I don't think there's really much of anything that can severely impede the Star Dragon. Most units advanced forwards, the Bulls moved quickly in the center, faster than I had expected. The Mournfang shuffled forwards to make sure I didn't have an easy charge on them. Magic is 9-6 and a boosted Bullgorger miscasts wounding the Butcher and costing the other dice. In shooting the Hunter wounds the Frostheart once with a harpoon and the Thundertusk fires everything at the Flamespyre but fails to harm it. 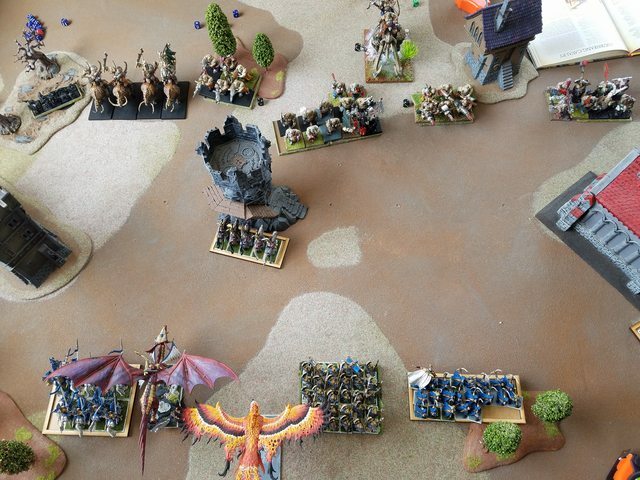 One unit of Leadbelchers kills a Dragon Prince while the other kills 3 Archers. The army advances forwards. 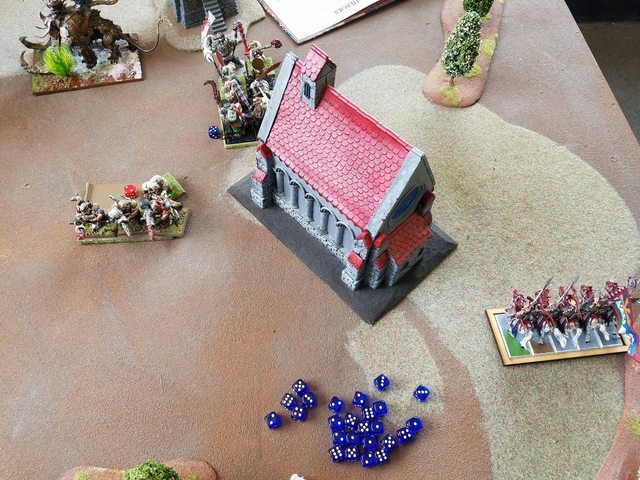 The small Dragon Princes head around the church to try and draw away the Ironguts while the Reavers move in the path of the Mournfang to direct their charge into a building and prevent them from charging the Dragon Princes or the Star Dragon. 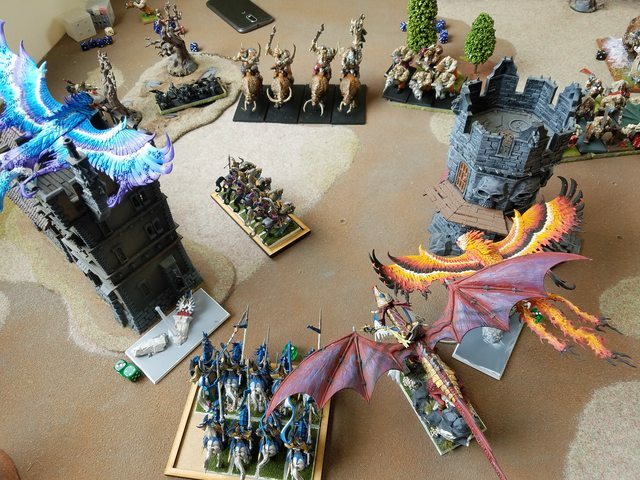 The Flamespyre moves behind the tower to flank the Ogre center, the Frostheart moves behind a building to hide from the Hunter's harpoon, and the Star Dragon and Dragon Princes move up to hit the Mournfang. The Archers and Spears hold station. Magic is a small 4-3 phase that sees Miasma on the Leadbelchers opposing the Star Dragon scrolled. 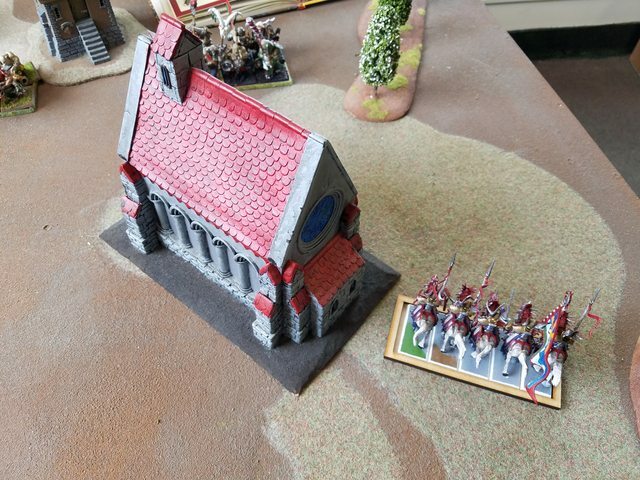 The Archers then put 4 wounds on the other Leadbelchers. A last minute adjustment of the Small Princes unfortunately brought them within average charge range of the Ironguts which I had been trying to avoid. Therefore the Ironguts charged the Small Princes who fled to prevent the Ironguts from appearing behind my flank shortly. The Gnoblars then charged the flank of the Reavers. The center again advanced forwards. Magic was 5-5 and Toothcracker on the Bulls was dispelled while Bullgorger failed to cast the boosted version. The Leadbelchers shot the Star Dragon but didn't harm it, the other Leadbelchers killed 4 more Archers, and the Hunter harpooned the Prince but his ward save protected him. Another direct hit from the stone thrower wounded the Flamespyre once. In combat the Gnoblars take one casualty without causing any and the Reavers reformed to face them. I'm now in an extremely annoying situation that I didn't expect. The one possible bad result of the Reaver positioning had happened as they were now covering the Mournfang from my charges. 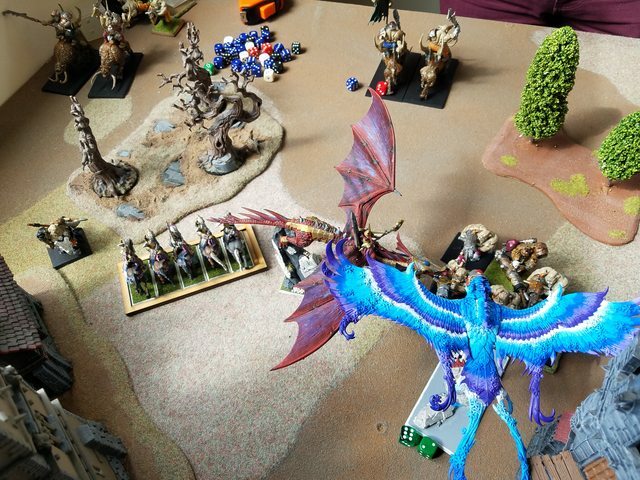 The Dragon Princes, Frostheart, and Star Dragon could not all fit in with their charges. Worse, I couldn't get both the Frostheart and Star Dragon into the Mournfang. I therefore decided to charge the Star Dragon into the Mournfang and the Frostheart into the Leadbelchers. 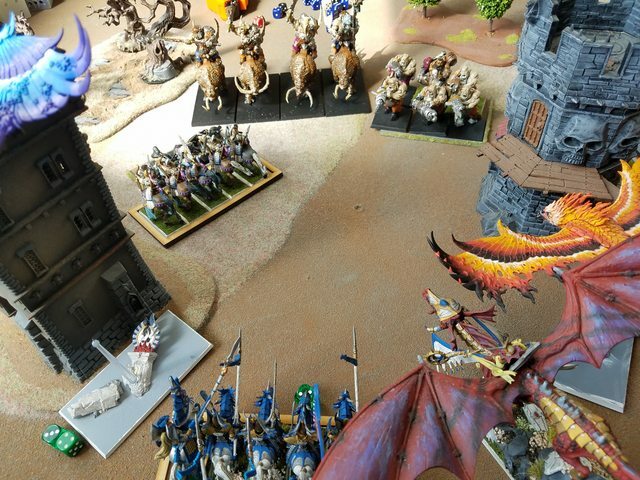 The Dragon Princes reformed and headed towards the center to flank the Bulls while the Archers and Spearmen shuffled backwards to be out of average charge range for the Bulls. The Flamespyre flew over the Bulls wounding them twice and took up position behind them. Magic was 9-6 and Miasma miscast on the Bulls dropping their movement by 2, but killing 5 Archers. The Archers then killed the wounded Leadbelcher. The Frostheart disappointingly only wounded the Leadbelchers twice, then disastrously took two wounds. The Reavers then killed 6 Gnoblars without taking damage and ran the Gnoblars down and into the Mournfang fight. The Star Dragon and Reavers then killed 2 Mournfang and wounded another one once and took no damage in return. The Mournfang broke and the Star Dragon reformed to face the Leadbelchers to rescue the beleaguered Frostheart instead of chasing them. I then made a rules mistake in not having the Reavers pursue the Mournfang. Casualties had taken the Mournfang out of base to base with the Reavers and I thought that they then could not pursue the retreating Mournfang, though reading the rules again I believe they should have been able to. The Hunter charged the flank of the Frostheart Phoenix skirting around the Reavers. The Bulls failed their charge on the Spearmen and shuffled forwards. The Ironguts turned towards the center and the Thundertusk turned to face the Flamespyre. The Mournfang survivors rallied. Magic was 7-5 and a 3-dice casting of Toothcracker made it through the 5-dice dispel attempt to boost the Bulls and a bubble version of Bullgorger was scrolled. The Flamespyre then took 3 wounds from the Thunderhorn harpoon and 5 Archers were killed by the Leadbelchers. The Frostheart then wounded the Leadbelchers 3 times and took none in return. The Spearmen and Dragon Princes tried to execute their trap. 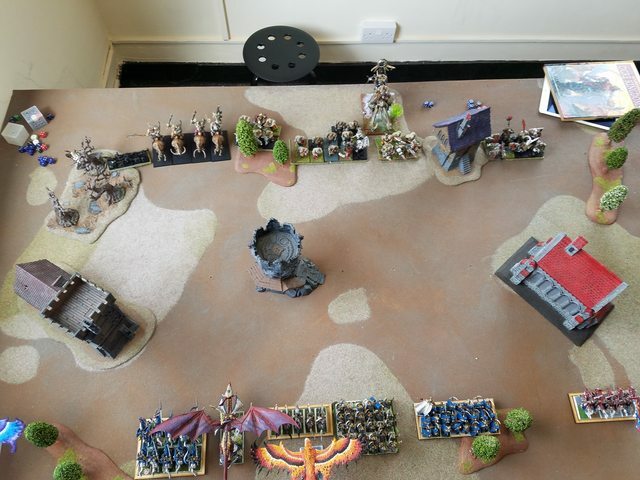 The Dragon Princes hit the Bulls in the flank but the Spearmen rolled double-1s and stayed put. The Star Dragon charged the Leadbelchers. The Small Princes moved forwards to get back into the game. I had been waffling on whether or not the charge the injured Flamespyre into combat, and after I decided against it I promptly forgot to move him at all, leaving a flank open to the Thundertusk. Magic was 6-5 and Miasma went on the Bulls for WS. The heavily damaged Archers only wounded the Leadbelchers once. 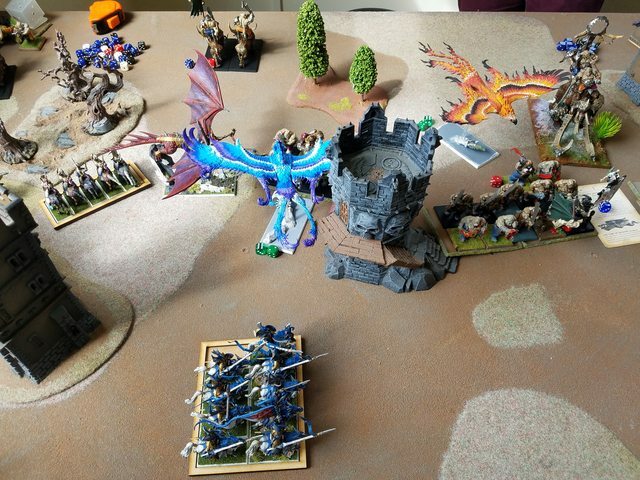 The Frostheart and Star Dragon then wounded the Leadbelchers 8 times taking no damage in return. 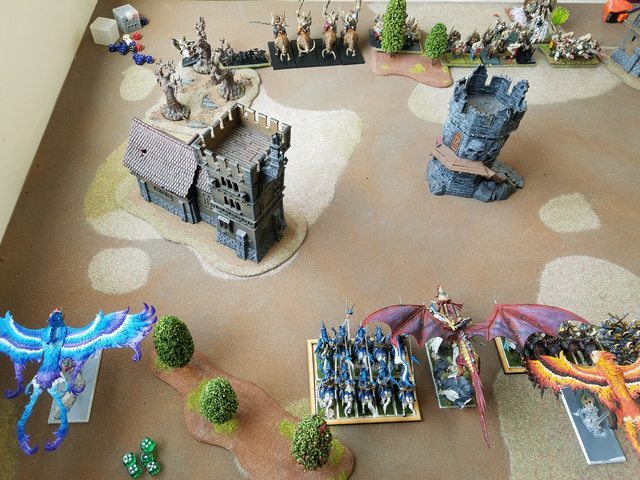 The Hunter and Belchers both fled with the Star Dragon running down the Leadbelchers and the Frostheart failing to catch the Hunter. The Dragon Princes wound the Bulls 5 times and take no damage in return but the Bulls hold and reform to face the cavalry. The Thundertusk charges the Flamespyre and the Ironguts fail towards the Star Dragon. 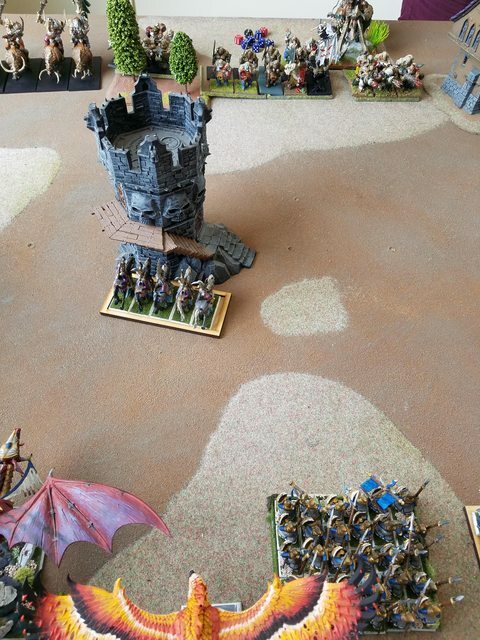 The Leadbelchers fail their charge on the Archers while the Mournfang charge the Dragon in the rear. Magic is 7-3 that has Bullgorger go onto the Bulls and the bubble Toothcracker cast. The heroic Flamespyre than manages to wound the Stonehorn twice after being invigorated by the Winds of Magic previously and then miraculously doesn't take any damage! 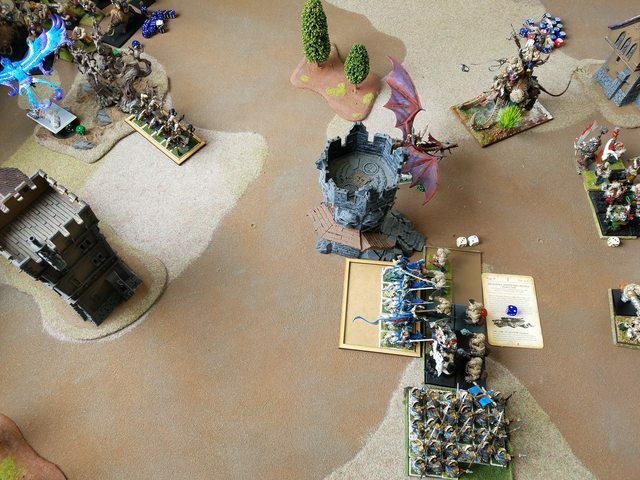 The Mournfang then hit the Prince for two wounds while the Star Dragon wounds them 4 times, however, they hold and the Star Dragon turns to face them. 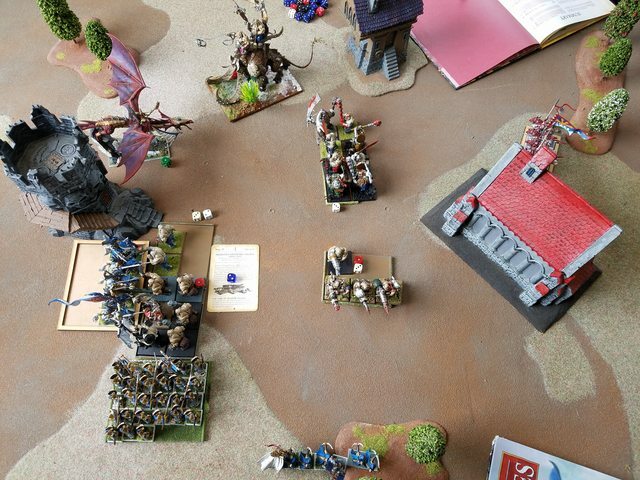 The Dragon Princes then wound the Bulls 3 times taking 2 wounds for a tie combat. The Frostheart charged the Hunter and the Spearmen charge the flank of the Bulls. Magic put Miasma on the Bulls dropping their WS by 2. The Archers put one more wound on the Leadbelchers. Combat saw the Spearmen and Dragon Princes wound the toughened Ogres only 4 times, with 3 Spearmen dying and 2 Dragon Princes dying. The Ogres held in combat due to the BSB reroll. 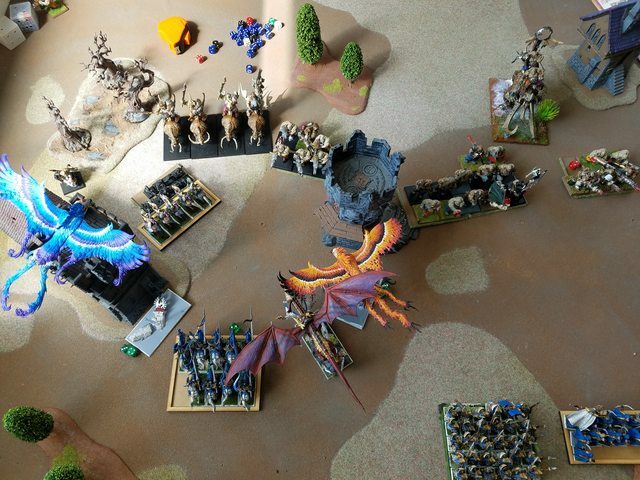 The Star Dragon then barely killed the Mournfang after some bad rolls and the Frostheart wounded the Hunter 3 times taking 1 in return, but running the Hunter down. The Thundertusk then killed the Flamespyre. 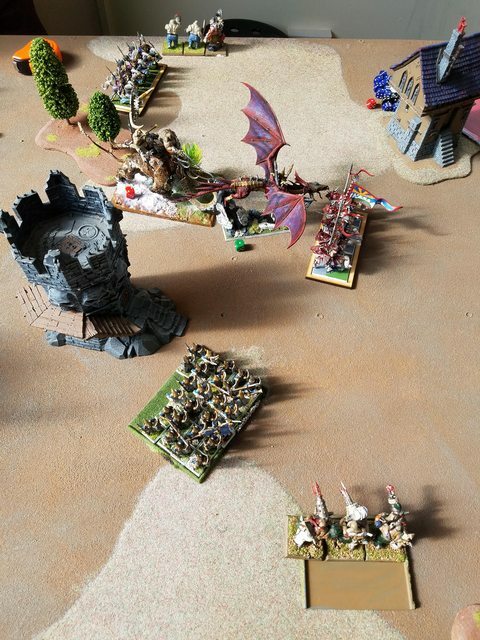 The Leadbelchers charged the Archers and the Ironguts charged the Star Dragon. 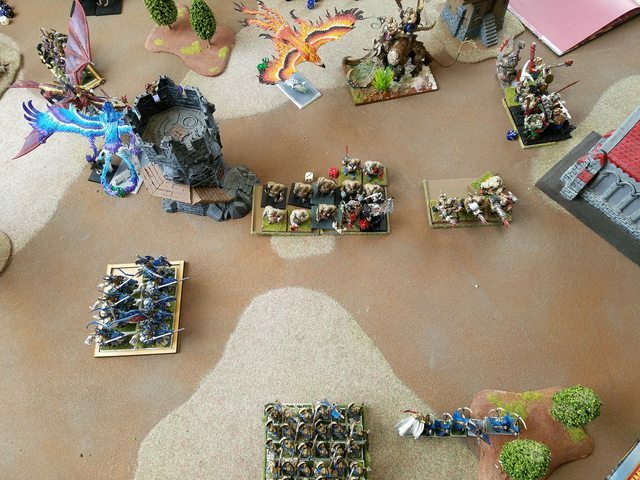 Magic was 6-4 that put Bullgorger on the Ironguts but Toothcracker was dispelled on the Bulls. The Stonethrower made 3-for-3 and got a direct hit on the Frostheart, but failed to hurt it. The Archers wounded the Leadbelchers once but were wiped out in return along with the Mage. The Star Dragon then challenged the Bruiser who was forced to accept. The Star Dragon took one wound but killed the Bruiser. With the Bulls one Spearmen died and 2 Dragon Princes but the Bulls took 7 wounds and broke from combat. The Dragon Princes not only failed to catch them but also unfortunately the pursuit took them right into the Ironguts! The Small Princes continued to move up to try to get into the fight and the Spearmen turned to face the Leadbelchers. 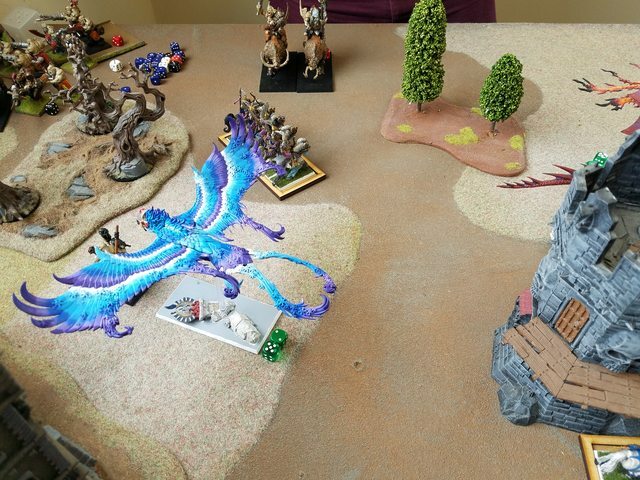 The Frostheart moved to cover the Star Dragon from the Thundertusk and the Reavers moved behind the Thundertusk. Combat saw the Dragon Princes killed by the Ironguts and the Star Dragon take 3 wounds. 8 wounds were done to the Ironguts, but they held in combat. 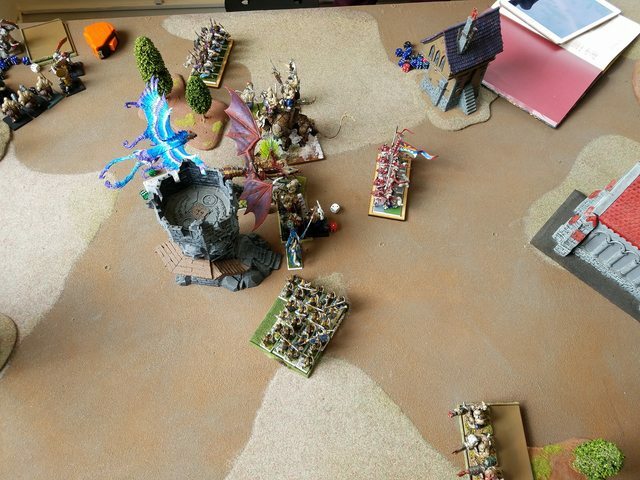 The Thundertusk charged the Frostheart and the Bulls failed to rally but stayed on the board. The Leadbelchers tried and failed to kill any of the Small Princes. The single Irongut on the flank then killed the BSB but the Ironguts were wiped out after losing combat and being caught in the pursuit. The Thundertusk took 2 more wounds but killed the Frostheart. 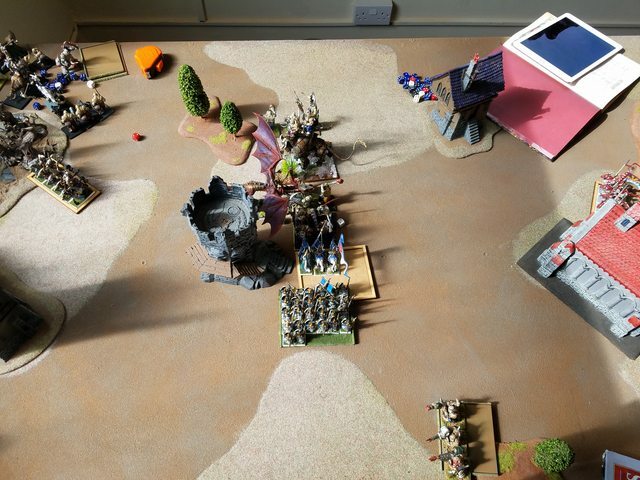 The Reavers ran the Bulls off the board and the Spearmen charged the Leadbelchers killing them at the cost of 4 elves. The Star Dragon was blocking the Small Princes from charging the Thundertusk as they would have liked. This game was tougher than I had initially expected, I thought with the Thundertusk not supporting the Mournfang and the Ironguts so far out of position it would be easier to win. My mistake with the positioning of the small Princes moving them slightly too close meant that they never got into the fight and only occupied the Ironguts for 2 turns instead of what could have been more. The Reavers and the Gnoblars were also crucial to the game in a way I hadn't expected at all. Any result of that combat would have been better than the one that occurred. 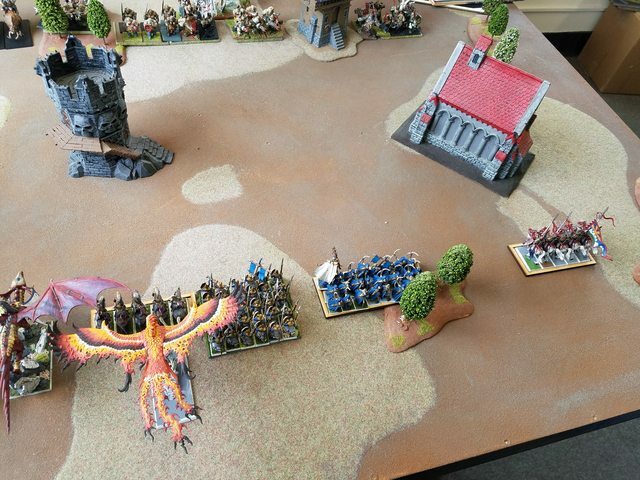 Had the Reavers been forced to flee and gotten caught that would leave the Gnoblars exposed and my fliers could just move over them and the Dragon Princes could charge them and overrun into the Mournfang like the Reavers later did. Or if the Reavers had forced the Gnoblars to run then they would have been out of the way. Instead they blocked up my charges. In hindsight the charges I did were not the right ones to do. The Star Dragon was correct in the Mournfang charge but the Dragon Princes should have hit the Leadbelchers instead of the Frostheart, which I believe would have fit. This would have forced the Leadbelchers to flee and the Star Dragon could have chased down the Mournfang. I was motivated against that by the Hunter's harpoon concerning me for the Frostheart especially with his Big Name. The Frostheart could have moved to the center or moved to counter the Hunter in some other way. I also shouldn't have forgotten to move the Flamespyre and I'm really not sure how I did, but I didn't notice it until the shooting phase. The Thundertusk is also remarkably powerful, particularly with the Ironguts as it made my Star Dragon attack at the same time as the Ironguts and removed the rerolls from my Prince. The Ogre magic was also much better than it should have been, but this was partially because my opponent's casting rolls were extremely good, never rolling below a 9 or 10 to cast a spell whether using 2 dice or 3. My strategy this game broke down due to the Reaver positioning and my error in charge choices and that turned it into a swirling melee that very nearly cost me the game. We had a bit of time left over before the store closed, so we decided to fight out a 1500 point game which I will post next! I agree that Archery is more reliable. However, a low magic phase pretty much means you get precisely one spell through, unless he wants to burn a scroll. Ultimately of course it’s very difficult to redirect flyers, so your army cares less than most. The Ogre list just doesn’t bring enough tools, does it? No cannon, limited magic. It did have some shooting, which at least made the Phoenixes pay attention. I’m not sure splitting it’s fighting power between the Bulls and Ironguts was wise, the usual Gutbus looks better. Deployment looked OK, I agree the Ironguts were a bit isolated. I see what you mean about the Reaver combat. Critically though, the Star Dragon still had a clear path and you’re always favourite for me after that. The Thundertusk was indeed good, wasn’t it? Ogres can grind surprisingly well I’ve found but here you just had too much force for them. Well that list just looks mean. I'm not quite sure what the best strategy to fight it would be. Do you think the best target for archer fire would be the bolt throwers or the Warlocks? I can see arguments in favor of both. My cavalry could probably beat any of the enemy units in combat, but that depends on being able to catch them and depends on how intact they are when they reach combat. Likewise I think the Star Dragon could beat anything there in combat and I think the Frosthearts would have a very good shot against the pegasus heroes in combat, though that could depend on if the pegasus heroes get the charge with lances/if they have great weapons. But that of course depends on getting the charge on them, they'll match my maneuverability and with their firepower advantage they've got less incentive to meet me in combat. I think that could be a very tough match-up for me. It did have a few issues. Without cannons it was a bit lacking in heavy hitting. The Ironguts always hit hard and I thought the Mournfang had potential as long as they managed to attack, but they didn't get most of their attacks in due to low initiative. That's one reason why I thought that the Thundertusk should support the Mournfang. I think having two Ogre units is fine, I've seen it work well, but all the characters should have been in one bus and I think an Irongut bus with Bull support would be much better than a Bull bus with Irongut support. The grinding power of Ogres was something that I had anticipated, but it was still more than I expected, particularly with those extremely simple +1 S and +1 T spells, they are amazing for their value. Their big problem was me beating them in combat and then them breaking because their Leadership isn't that good. I now realize why Spinemarrow is actually a really good signature spell! I do think the list would also have done much better with a Level 4 or a Tyrant, which my opponent acknowledged as well, this was a variant list trying out the Hunter for the first time and in another version he drops the Hunter and replaces a Bruiser with a Tyrant and in a different one he takes a Slaughtermaster instead of a Tyrant. Both of those lists I think would be better, though admittedly they'd lose some of the shooting that caused the Phoenixes issues. As a side note, it was pointed out to me elsewhere I forgot to place the Phoenix Reborn counter! I should pay more attention to my rules on models I don't play often. The Warlocks are definitely public enemy #1 and must be persecuted with extreme prejudice! Mobile boosted Doombolt is just too dangerous to allow. The Star Dragon doesn’t care (or about much else in the list) but a casting of The Withering for example could suddenly change that. The shooting isn’t horrific but it can chip away at you. Low Initiative can be a real problem for Monstrous Cavalry, it’s why Bloodcrushers for example are no good. Again I completely agree that the Bulls should be the support, without characters. I believe the standard banner choice is +1 Ld on the Ironguts, Rune Maw on the BSB. As you must know from Lizardmen CR, even a modest magic phase is really helpful and doesn’t have to cost the earth.